Mrs. Yu and her lady friends had just finished eating the eight-course lauriat at the Golden Dragon. The head waiter combined the remnants of noodles, pork, pigeon, abalone, lobster, and fish all into one plate and signaled the rest of his staff to start packing the dishes. “What’s for dessert?” Mrs. Ang asked as she brought out her compact mirror and stared at the reflection of her teeth. “I’m dreadfully tired of mango pudding and sesame seed balls. I hope we can try something different,” Ms. Tan said. “Not to worry, Ellen,” said Mrs. Yu. “I talked to the manager, and he had something special prepared for tonight.” Not even Mrs. Yu knew what the restaurant had in store for them as she signaled the waiters to bring in dessert. Small plates were distributed around the table, and the head waiter carried with him a modest tray filled with what looked like crusty conch shells. “Fortune cookies! How faux Chinese. I thought they stopped serving these here,” Ms. Tan said. Dessert had officially begun, and everyone started eating their fortune cookie, some taking out the paper beforehand, others drawing it out of their mouths like snake charmers. Everyone said their farewells except for Mrs. Yu, who opted to stay. “Don’t worry about me. I just need to thank the manager personally,” she said. Once they left, she approached the head waiter and asked if he had any fortune cookies left. Hers had been devoid of any sayings, and she felt a certain embarrassment if she were to admit this to her friends. While she had successfully bluffed her way out of that predicament, the night did not feel complete without finishing this particular ritual. The head waiter motioned for one of his companions, who then brought out another tray filled with fortune cookies. Mrs. Yu flashed her smile, snatched two of the cookies, and stored them inside her purse. She felt fortunate that she was a regular patron and wielded a certain influence with the staff. It was rumored that The Golden Dragon was barely breaking even and would be cutting down on its staff soon. It wouldn’t do to disappoint one of their best customers. After exiting the restaurant, she looked around and made sure no one was about. When Mrs. Yu was convinced that she was alone, she drew out a fortune cookie from her bag, cracked it in half, and pulled out the strip of paper. Mrs. Yu, as a reflex, smiled. “Calm yourself,” she said out loud, as merely thinking about it was not enough to assuage her doubts. At least she had the foresight to grab a spare. She took out the last fortune cookie, and her hands trembled. She wondered what would happen if this fortune cookie was another blank. Shouldn’t it be called fortune-less cookies then? How preposterous. Or maybe there were defective cookies in the batch, and she was simply unlucky. But even that fact conveyed a certain fate, a sign of disharmony in her life. Mrs. Yu cracked open the fortune cookie and hoped to see some etchings in the strip of paper. It didn’t matter if the advice was written in Hanzi, a language she never mastered with its endless combination of radicals and reliance on rote memorization, as long as there was some sort of advice. Like the previous ones, it was a blank. 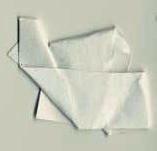 Mrs. Yu stared at the white piece of paper. At first she felt rage. She will sue the fortune cookie makers! It didn’t matter if the cookies contained good fortune or bad fortune, as long as they actually contained something. Why, what would have happened to the Ming revolution if the bakers failed in their simple duty to smuggle messages into their mooncakes? The citizens would never have successfully rebelled against the Mongol invaders. Once Mrs. Yu’s fantasy ran its course, her thoughts ran in another direction. Maybe the blank strip of paper was the message, a symbol of sorts. White was the color of death, and it was possible the fortune cookie was predicting her demise. She pondered the implications. Her first thoughts were of Mr. Yu, a stout man who went to work every day without fail. As industrious as Mr. Yu was, he was ignorant of life’s basic necessities such as cleaning, cooking, and accounting. She imagined the police breaking into their home, finding Mr. Yu’s room cluttered with various magazines and clothes, and somewhere in the mess was Mr. Yu himself who had become as thin as a Chinese brush because he failed to shop for groceries at the market and had mismanaged his funds with all the take-out he ordered. And then there was her Sunday group whom she met on a night such as this. There would be no one to arrange the dinners, schedule the meetings, settle the bills, and rein in the various members of the group. Mrs. Ang would be spending her time watching young men, even if she was the oldest in the clique and married to a faithful gentleman. Ms. Tan was too daring and would get everyone lost, jailed or bankrupt, depending on the particular thrill she might suggest for the night. And poor Mrs. Yu always reminisced about the past. If she had her way, they would be spending their evenings in her apartment, talking about the days gone by and admiring dusty photo albums. No, it could not yet be her time to die. The fortune cookies at the Golden Dragon were simply a fluke. She went to an obscure Chinese take-out in the dark corners of Chinatown. It had the stereotypical phrase Ni Hao, the logo was missing a few characters, and the chef wasn’t even Chinese, but it was one of the few restaurants that still served fortune cookies in Manila. Mrs. Yu didn’t even bother scrutinizing the menu. She ordered the cheapest pack meal and tapped her foot as the staff scrambled to grab her order. When it arrived, she dumped the contents into a fly-infested trash bin but not before taking out the fortune cookie. The cookie itself wasn’t spectacular. It was brown rather than golden, and the edges were bent rather than curved. At least she didn’t have to eat it, Mrs. Yu thought, before she broke it in half and drew out her fortune. It was another blank. Now, she had four such strips of paper. Four was an unlucky number –- it had the same phonetics as the Chinese word for death. Perhaps it was foolish of her to challenge the will of the gods. Mrs. Yu resigned herself to her fate. Well, if she were to die today, at the very least it might as well be at a venue of her choosing. The apartment she shared with Mr. Yu felt too confining. Besides, she didn’t want to leave him in shock should he discover her corpse in their bedroom. The local church seemed a poor fit. True, it was where she met her Sunday group, but she was never as pious as she appeared to be, and the only reason she was so faithful in her attendance was because it was where she chatted with her friends. Maybe she should return to the Golden Dragon, her previously-favorite restaurant. They deserved the impending confusion for serving her the fortune cookies in the first place. Hopefully it would become a scandal on local TV: the media would dig up the identity of its owners, one of the waiters would be revealed to have had a secret affair with a celebrity customer, and the kitchen would be investigated for violating health codes. She was even willing to settle for an urban rumor, the type that was propagated through email and text messages. Somehow, the thought comforted her, and she felt a sense of liberation. It was only the foolish, after all, who fought with fate until the very end. The trip back was arduous. She was accosted by thieves who demanded that she surrender her money and cellphone. Mrs. Yu simply had a glazed look as she handed over her purse. Would she die now, the victim of a street stabbing? While crossing the street, she stumbled on the gravel that was eroded by tires and the weather. Her right heel broke, and Mrs. Yu wondered whether a speeding car would hit her then and there. When all she got was blaring traffic horns, she got up quickly and walked away with a limp. A few blocks from the Golden Dragon, there was a sudden downpour, but Mrs. Yu couldn’t be bothered to look for shelter. Perhaps Lei Gong would finally strike her down with one of his thunderbolts. Instead, all she got was disheveled hair, smudged make-up, and a soaked outfit. By the time she reached the Golden Dragon, the parking lot was empty, and the head waiter was about to put the chains and lock around the door. “Wait,” Mrs. Yu shouted. She had lost all her composure by then and had only a yearning to collapse inside the restaurant and condemn its owners to the eighteen levels of hell. Why did they ever serve her fortune cookies? It wasn’t even real Chinese food. At first, it appeared to Mrs. Yu that the head waiter did not recognize her. He took a step back and held tightly the chains of the lock. Perhaps it was her limp that made her movements devoid of poise. Or maybe the rain had ruined her make-up, and she resembled a jiang shi more than someone regal. She would have called out his name to catch his attention, but Mrs. Yu realized that despite knowing him for the past eight years, she couldn’t recall his name, even when the official uniform required them to wear a shiny nametag. Mrs. Yu could not tell whether it was recognition or pity that made the waiter relax his grip on the lock and approach her. She could sense some hesitation as he came closer, so she decided to reach out to him when her strength finally gave out and she fainted. When Mrs. Yu regained consciousness, she found herself inside one of the carpeted dining rooms. At first, her vision was a bit blurry, and she mistook the head waiter for her grandfather, a bald and gaunt man who often flashed her a toothless smile. “Why did you come to the Philippines?” she once asked her grandfather. With all their stories about China, its language, people, and culture, Mrs. Yu wondered what would have made her grandparents leave the mainland. “I wanted to start over with a blank slate,” he replied. He didn’t elaborate further, as if his statement was self explanatory. Mrs. Yu didn’t comprehend its implications at the time, but right now, it sounded like an adage for a fortune cookie. Mrs. Yu’s vision cleared up when she heard the sounds of a familiar voice. “What did you say?” the head waiter asked. The head waiter gave her a look of incomprehension, his typical reaction when he encountered customers speaking in Fookien, Mandarin, or Cantonese. Mrs. Yu was about to rebuke him when she remembered where she was. It was way past business hours, and the waiter didn’t have to take her inside to attend to her as if she was his responsibility. There was no profit to be made. Mrs. Yu fumbled through her pockets and found that she still had the four white strips of paper. “Pen. Can I borrow your pen?” Mrs. Yu demanded. The head waiter took out the pen clipped to his right breast pocket and gave it to her. Perhaps being fortuneless wasn’t necessarily a bad thing. Even though Mrs. Yu wasn’t particularly good with Chinese characters, she managed to write on one of the strips of paper the Hanzi for prosperity, a word with which she was quite familiar due to the numerous money-filled red envelopes she received during her birthday. Ever since I first read this story, I've wanted it. Many thanks to Charles Tan for his permission to reprint, though he has so far resisted my lobbying on behalf of Mrs. Yu (and my own pleasure). We think she should haunt Charles Tan's dreams, and appear in a series of his stories. 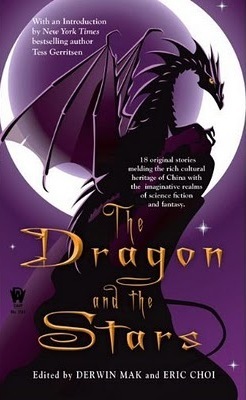 The Dragon and the Stars edited by Derwin Mak and Eric Choi, published by Daw Books, 2010. This anthology is a nominee for a Prix Aurora. Charles Tan's Bibliophile Stalker is also in the running now for a World Fantasy award. "Charles Tan has in a very short time, become a major force in science fiction and fantasy." whose payment was less than a brass razoo.